Just as the ever-echoing knell of Scottish Football’s funeral bell seemed to be resonating louder than ever, up pops Stephen Thomson with a timely shot in the arm that could, and indeed should, transform the fortunes of one of the country’s biggest clubs this season. It’s been a funny old season so far in Scotland’s top flight for several reasons, most apparently the absence of one half of the Old Firm. When the news first broke that there’d be no Rangers in the SPL this season, one of the first questions that football fans began to ponder was ‘who’ll challenge Celtic for the title?’ You’d be forgiven for expecting Dundee United to be in with as good a shout as any, (at the start of the season of course). Their dogged style, recent history of moderate success, and formidable squad (on paper at least) led many to believe that they were contenders. Without going into too much detail, it didn’t come to fruition, much to the frustration of the Arabs. With Peter Houston at the helm this season, the club embarked upon a whole host of baffling signings, and an abominable run of form at Tannadice. Radoslaw Cierzniak apart, the signings were poor, and the Tayside club have recorded just two wins at home in the league. But with players like Johnny Russell, Gary Mackay-Steven and Jon Daly to call upon going forward, there’s no way the club should be languishing behind ‘smaller’ clubs like St Johnstone, Motherwell and Inverness Caley Thistle (as impressive as they’ve been this year). When the friction between Houston and the board became too much and it became clear he’d be leaving, I did worry that we’d see some haggard or soulless Scottish Football journeyman being rolled out to act as a safe bet. Sometimes change is needed, and Stephen Thomson saw this. The slow death Scottish Football is enduring is as a direct result in part to some of the unadventurous and fundamentally dull managers like Jim Jeffries, Bobby Williamson and Gus McPherson (to name but a few). It would have been easy for Thomson to go down this route, but he’s taken a gamble on a young, passionate manager with a penchant for attacking football. I for one believe this gamble will pay off. 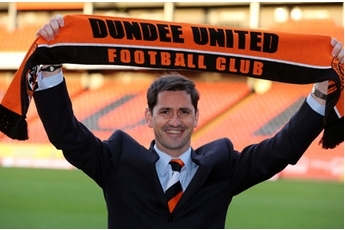 Jackie McNamara ticks all the boxes. He’ll command the respect of the players given the illustrious career he carved out despite not necessarily being the most talented player out there. McNamara, with a spot of good fortune and the right attitude on and off the park, won titles, played for his country, and played against some of the best players in Europe. I’m confident McNamara will instil this idea of knuckling-down to reap rewards and punch above your weight in his new Dundee United squad. Are any of the less well-rounded, young players at United any worse than McNamara was at Dunfermline as a player? I think not. If Jackie can get across to his players that attitude outshines ability any day of the week, then there’s no limits to what his squad can achieve. Plaudits rained in from all over the media for the success McNamara brought to his Patrick Thistle squad, and rightly so. His Partick side has lost just once at home this season, and can go top of the First Division if they win their two games in hand over Greenock Morton. This, combined with steering his team to the final of the Ramsdens Cup, drew in big crowds, sometimes upwards of 5,000. Football fans vote with their feet. If the product on the pitch is good enough, the club won’t have to worry about empty seats. This was the case at Partick Thistle under McNamara, and Stephen Thomson will be hoping that his new manager’s passion attract fans back to Tannadice to cheer on the Terrors. No manager’s appointment guarantees success, and everyone at Dundee United will know that there’s a lot of hard work to be done over the next few months. That said, given the options available, there was no better choice than McNamara. For the good of the game in this country, I hope the new Dundee United manager transfers and enhances the same excitement he generated at Firhill, to his new employers 80 miles up the road. Hats off to Stephen Thomson for being bold enough to try something bold, and good luck to the SPL’s newest manager, Jackie McNamara. No chance, Paul lamberts boat is sunk ! I think united will flourish with new impetuous , I think Houston did well as he lost an awful lot of players for not a lot of money therefore replacing them was a non starter really ! I think young jackie will have fresh ideas and play decent football ! Mon the shed ! !